Being seated all day, your leg muscles & gluteus muscles will become inactive, thus reducing your ability to sit up straight. Staying fixed in one position, insufficient fresh, oxygen-rich blood will be pumped around the body, causing the brain function to slow down. 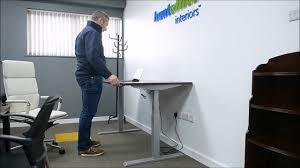 Check out our latest ranges of manually & electrically operated height adjustable desks available to view in our Limerick & Dublin showrooms today!